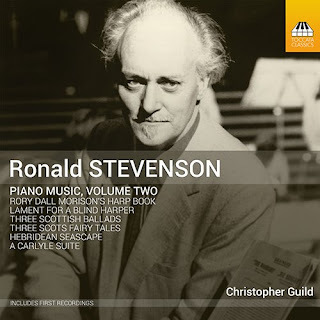 The composer / pianist Ronald Stevenson left a huge legacy of piano music, and the challenge for performers on CD is to make a coherent and satisfying programme. The pianist Christopher Guild is recording Stevenson's piano music for Toccata Classics, this is the second of his discs and on it Guild includes Stevenson's Hebridean Seascape (a transcription of a Frank Merrick piece), Three Scots Fairy Tales, A Carlyle Suite, Rory Dall Morrison's Harp Book, Three Scottish Ballads, and Lament for a Blind Harper. It is the folk-song of Scotland (Stevenson's adopted country) which weaves its way through much of the material on the disc. Hebridean Seascape is an imaginative transcription of the slow movement of a piano concerto by the composer / pianist Frank Merrick, and the central section includes a Skye fisherwoman's chant. It is quite a virtuosic piece, designed for a pianist such as Stevenson was (he was no mean interpreter of his own music). The next piece is completely the opposite, Three Scots Fairy Tales was written for children but Stevenson certainly does not write down. A Carlyle Suite was written for the Carlyle centenary celebrations in 1995. A five-movement piece, it shows both Stevenson's sense of humour (though some of the jokes are only visible to the pianist reading the music), and his ability to conjure other styles, so in the second movement there is an evocation of a recital given by Chopin for Jane Carlyle, with Stevenson wittily combining Polish dances and Scotch snaps! The third movement is a set of variations on the theme used in Bach's Musical Offering, moving from the baroque to the contemporary. Rory Dall Morrison's Harp Book is a set of realisation for piano (or clarsach) of tunes from a 17th century Scots harp book. Short, but charming pieces which show Stevenson's imaginative but sensitive way with folk-song. In Three Scottish Ballads Stevenson gives us his version of three rather gruesome Border ballads, Lord Randal, The Dowie Dens o'Yarrow, and The Newhaven Fishwife's Cry. They show Stevenson at his imaginative best, combining the music of Scotland with his own voice. The work on the disc, Lament for a Blind Harper is based on a melody by his daughter, the harpist Savourna Stevenson. Guild also contributes a valuable booklet essay which provides background both on Stevenson's career and on the music. There is much to enjoy on this disc, and Guild is adept at both the children's pieces and the more virtuoso passages. The disc is part of an opening up of Stevenson's repertoire on CD, and will certainly be welcome to lovers of Stevenson's music (four of the works on the disc are first recordings). That said, I am not quite certain whether it makes a recital disc that I would want to return to regularly. The varied nature of the pieces, and the rather short movement length of some, make it something of an attractive patchwork. Something in which to dip occasionally.